Oil on panel 23.3 x 34.4 cm. 9 1/4 x 13 1/2 in. This meticulously executed landscape stems from a Flemish tradition popularised by artists such as Pieter Bout, Adriaen Boudewyns and Matthys Schoevaerdts. 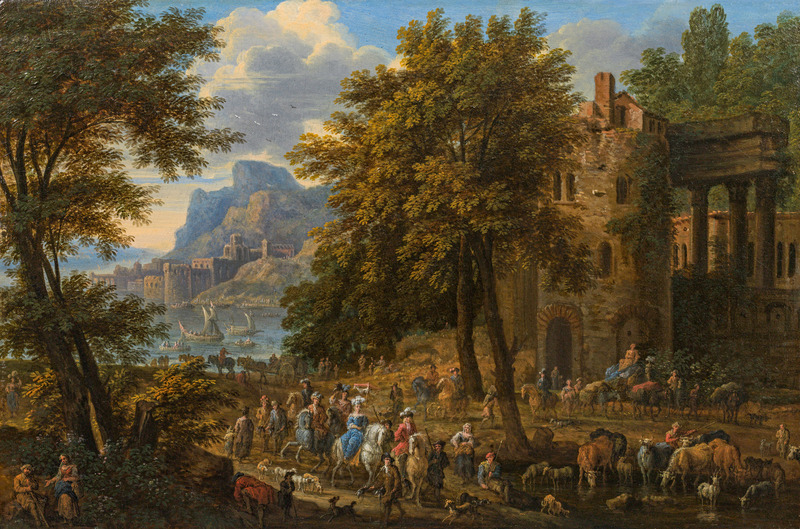 Hailing from Antwerp and accepted into the Guild of Saint Luke there in 1685, Van der Meiren is documented as living in Vienna in 1695, which suggests that he might also have visited Italy and encountered many of the scenes depicted in his jewel-like southern landscapes. Returning to his native city, he married Catharina Tassaert in 1690 and accepted Jaspar Broers as a pupil five years later. As a gifted figure painter he was employed by the Antwerp dealer Forchondt to execute the staffage in the landscapes of Adriaen Frans Boudewyns (instead of his usual collaborator Pieter Bout) and Lucas van Uden. His work was much admired and commanded high prices; among his patrons was Elizabeth Farnese, later Queen of Spain. As the latter did not become consort to Philip V of Spain until 1714, it is quite likely that Van der Meiren’s death was later than usually given, in fact in the mid 1730’s, which is the date of a work attributed to him in the Museum of Western and Oriental Art, Kiev. tradition of the Flemish master Jan Brueghel the Elder. Benezit lists pictures by the artist in the museums of Antwerp, Budapest, Dresden, Stockholm and in the Liechtenstein Gallery in Vienna. I am writing to enquire about "Travellers and Hunters in an Italianate Landscape with a Mediterranean coast beyond"